This seminar will focus on the context and history of Medellín’s transformation, as well as explore the ways in which Medellín can be an example of equity based urban governance and healthy city planning. The seminar will examine the concept of a City for Life, encouraging students to focus on a specific topic of their interest and provide the opportunity to lead a class discussion. Guest practitioners will add to the discussion of Medellín in the context of global urbanization and transformative planning practices. 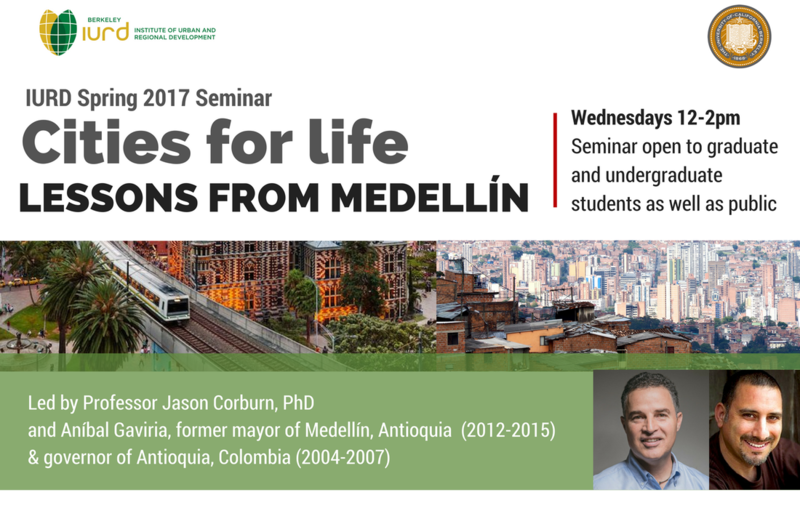 Aníbal Gaviria, mayor of Medellín from 2012-2015 and governor of Antioquia, Colombia from 2004-2007, will share his perspectives in conversation with Professor Jason Corburn and engage with seminar participants to expand upon the concept of a City for Life. The 14th International Conference on Urban Health will bring together researchers, practitioners, policy-makers, health and urban stakeholders and community leaders to exchange ideas and advance research and practice that promote the health of individuals in urban settings. The full programme will include optional pre-conference workshops, plenary lectures by invited speakers, contributed oral presentations and workshops in concurrent sessions, poster sessions, social events and pre and post conference site visits and field trips. Our students and faculty are presenting and at attending this important international conference in Manchester, UK. 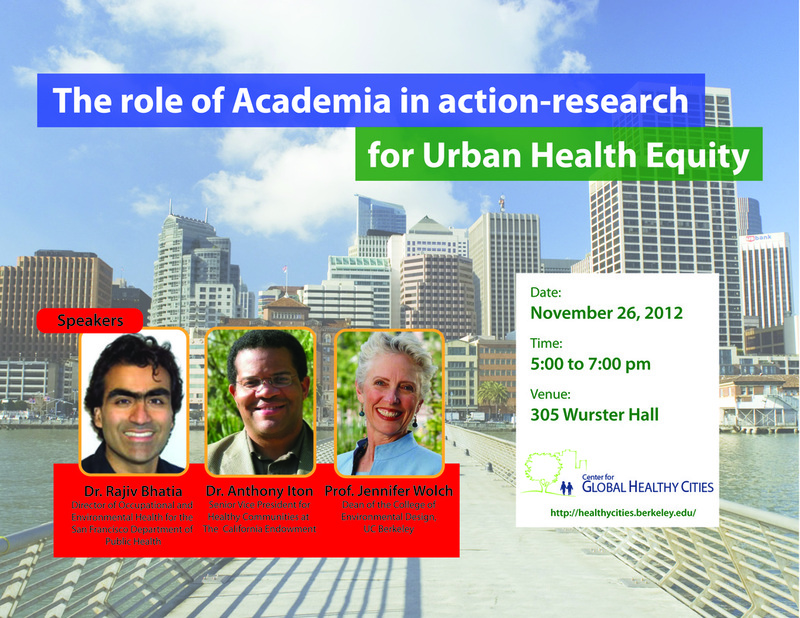 More specifically, Professor Jason Corburn, Director of the Center for Global Healthy Cities, will be co-chairing and keynoting the section on Urban Planning and Architecture and Health. The conference theme is Partnerships for Global Urban Health, an idea central to the mission of the Center for Global Healthy Cities. 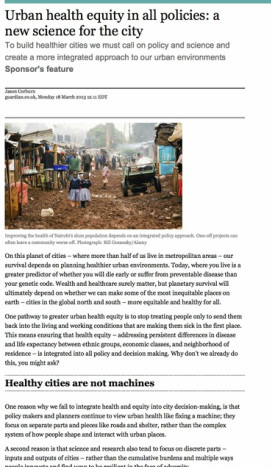 Professor Jason Corburn has published an article in the UK Guardian on 18 March 2013, discussing the links between a health in all policies strategy, urban equity and a new science of the city. 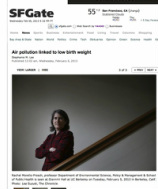 Professor Rachel Morello-Frosch and colleagues released a study on 6 February 2013, published in Environmental Health Perspectives, finding that mothers who breathe particulate pollution are significantly likelier to give birth to underweight children than mothers living in less polluted areas. The study showed robust findings in cities around the world and is one of the largest research projects ever examining the links between in-utero exposure to pollution and birth weight. Dr. Sidharth Agarwal, of the Urban Health Resource Centre in Delhi, India, October 2012. Professor Rachel Morello-Frosch discussing her work on cumulative vulnerability assessments and bio-markers for neighborhood stress. Professor Corburn has published, "URBAN INEQUITIES, POPULATION HEALTH AND SPATIAL PLANNING," Chapter 3, in Hugh Barton et al (eds), above; June 2015.